Noah Burlison is a prime example of a teenager with a dream. The difference between he and many of the others, though, is that he’s gone out and personally seized his opportunities by the horns. Burlison, a 600cc micro sprint racer out of the Razorback State of Arkansas, was told at the end of 2011 that his family didn’t have the funding to be able to continue supporting his pursuit of a racing career without help – either from a sponsor or by other means. Not one to give up, the young gun went out and found a sponsor. The lucky company? 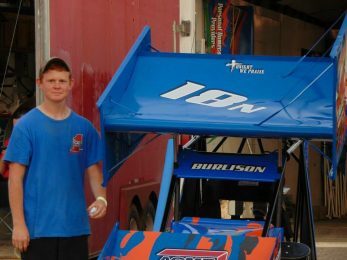 Burlison, now 16, started his own pressure-washing business to make up the difference in funding needed to race on the weekends, and three years after the original idea, the pipe dream has become a thriving reality – one that has ultimately not just made up the difference in money, but turned into the main source of income for the team. And though now, the high school student is again working on a promising career – the comeback almost never happened. Burlison has launched his power-washing business into a track championship last season at I-30 Speedway. Burlison has launched his career forward over the last 18 months, winning the Rookie of the Year award in the micro sprint class at his home track, I-30 (Ark.) Speedway, in 2013 and roaring to the track championship last year by 30 points over Jason Hall in a banner campaign for the rising star. Now Burlison hopes to use lessons learned from last season to go after a second-straight track title – he sits third in points through the season’s opening race at I-30 on April 11, nearly winning the event before being passed by Dusty Young late in the going. At the end of it, however, Burlison was simply happy to have finally raced – after being rained out at the fast quarter-mile for a month trying to get the originally-scheduled March season-opener in the books. However, Burlison hopes that with the help of new team owner Tim McKenzie, he will be able to find the success he has worked so hard to build. Burlison is driving McKenzie’s micro sprint but he and his family are doing the majority of the maintenance on the machine this season. “Back when we first got into the micro class, one of the very first guys I met was Tim Mackenzie. In the 2013 season he actually helped me change a motor and get it ready for one of our big races – the Fall Nationals at Riverside (Ark.) International Speedway – and then we went over to the same chassis as he was running last season, so it just made sense when he finally came to me and said ‘Drive my car’, for us to make the move,” Burlison explained. With the new situation comes new goals as well – and Burlison has big aspirations for the remainder of his season. But through it all, the fiery red-head has remained grounded and in touch with his family and friends while pursuing his dream. Asked if he missed having a social life, Burlison laughed before responding. Noah, I am so very proud of the young man you have become. I sure wish I was home to see you race, you know I would be if I could be. I love you and miss you all. Keep up the good work and keep me up to date on how the races go, please.